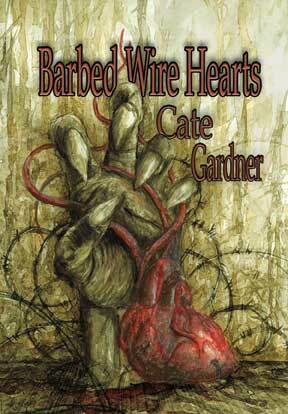 DarkFuse are having a sale which means you can buy the Barbed Wire Hearts hardcover (it's a gorgeous looking book) for just $12.50 (previous price $25). I should probably have added exclamation marks to that last paragraph. Here are some!!! So if you're interested in reading the tale of a boy who loses his heart in a rather unfortunate way, a dead girl whose heart starts beating again and an evil heart-collecting goatish man, then you can pick it up over at DarkFuse. (It is also available as an ebook). And it would be remiss of me if I didn't point out that they also have many other excellent books for half price including novels/novellas by Lee Thompson, Gina Ranalli, Michael Louis Calvillo, Greg Gifune, Ronald Malfi, John Skipp and many more. You can find the full list here. 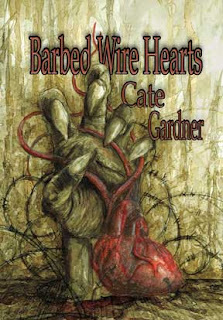 I highly recommend "Barbed Wire Hearts" at 50% off. Great story full of Cate's weird imagery. That's a good thing, right? It does and it's a fabulous name.